A black comedic sci-fi feminist allegory (yes, that is the best way to describe this genre-defying film) that was not only original in its story but also boast a winsome turn from Anne Hathaway that has been sorely lacking in her recent (Oscar-baiting) oeuvre. And no this is not just a monster-film. "Colossal" was refreshingly original and thoroughly enjoyable with its humorous black streak and feminist leanings. The originality of the story laid not only its premise but also in its execution. Writer/Director Nacho Vigalondo kept turning left when you expect it to turn right and not once or twice but almost constantly through its 104 minutes; that is so rare these days. But of course there were also moments where the pacing slowed too much and strange interludes which seemed at odds thematically. As a horror film, "Get Out" was more B-grade than "The Visit" or "Drag Me to Hell", relying heavily on an overbearing soundtrack and jump shots to heighten the tensions and crank up the scares. But as a satirical film of the times, it was emblematic of the current societal and political conflicts within America. However, it does not translate as well - beyond an intellectual level - to an international audience, especially in a predominantly non-Caucasian market. Critically, director/writer Jordan Peele came up with a fresh spin to an otherwise unoriginal story, but the execution was neither innovative or genre-breaking. There were quite a number of smart lines and many moments where the tension was purely in the words. Although, much of it seemed to be due as much to the excellent delivery by Bradley Whitford and Catherine Keener. We really do live in a time where we have so many choices in how we choose to consume entertainment and ideas. 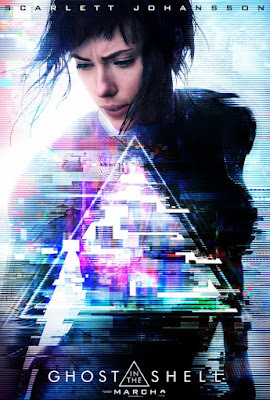 Unfortunately for Ghost in the Shell, what it chose to explore had already been done once, when the idea was still new and fresh, by the original anime and manga, and more recently and more superbly (and in depth) by TV's Westworld,Humans and even Dollhouse. Therefore, where it could - and does - succeed was in the technological (and monetary) front. However, there was only so much that souped up CGI can do to entertain and distract from the weak and uninspired plot. The screenplay was by Jamie Moss, William Wheeler and Ehren Kruger and it spent too much time building the world and neglecting the characters, such that when it finally got to the characters, the audience already felt disconnected. But even then, they could never really fleshed out the complexities and the morality of the tech, nor the complexities and moralities of their lead character.